33 year old Tomass Marnics from Latvia has put together a team of the world’s best extreme kayakers. 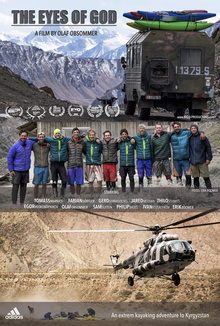 Together they plan to descend the legendary Saryjaz River in the no-man’s land between Kyrgyzstan and China. In the shadows of 7,500m-high peaks, the Saryjaz River thunders through the deep gorges of the Tien Shan mountain range before joining the Chinese Tarim River and ultimately silting up in the vastness of the Taklamakan Desert. The ultimate goal of the expedition is the final gorge before the Chinese border. The Eyes of God are in fact two huge caves in the rock face that look like a pair of eyes. Since the first explorers in katarafts visited the Saryjaz in the early eighties, the Eyes of God have been a magical place for adventurers and whitewater fans from the former Soviet Union. The extreme sportsmen will spend ten days cut off from civilization, in deep inaccessible gorges, sleeping under the open sky at night. They will also have to overcome the countless rapids at the absolute limit of what is possible in kayak sport – an undertaking that leaves no margin for error.